Better Dow Betters Do Time! In a previous blog I gave away an open investing secret – that you can make great returns simply by putting all your money in the simplest of all market indices, The Dow Jones Industrials Average, or Dow as we fondly call it. If you do that you will beat almost all professionally managed mutual funds or even private wealth funds (without special access or inside information). And you will beat all your friends, guaranteed. 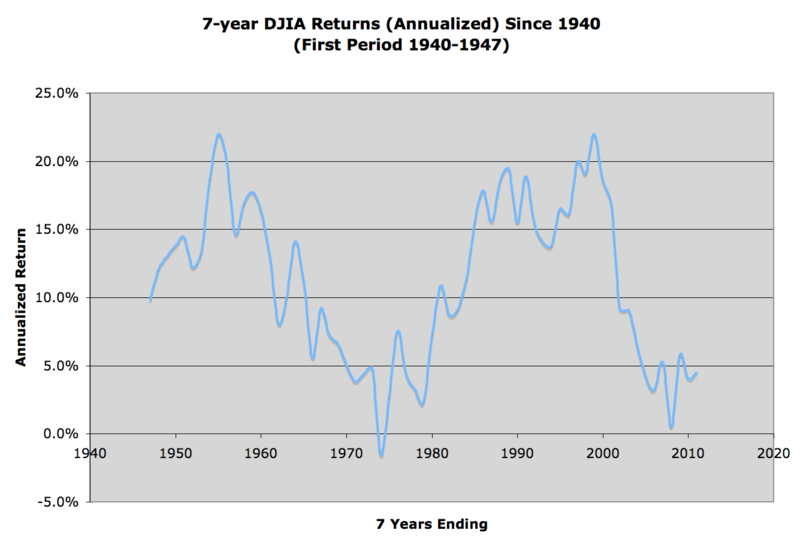 Notice the consistent annualized return of about 11.3%, regardless of the holding period. In this study I took randomly selected 100 starting dates for the investment and held each one to the stated holding period adding in dividends when received. Then I averaged all the returns to get the above numbers. As you can see we had only one period out of 64 where we lost money – in the seventies malaise – and even that was a small loss. Over a 20-year holding period the chart was even more amazing. We never failed to double our money in any period! So the moral of the story – if you can afford to lock up your money invest it in the Dow, reinvest the dividends and forget it. You will get the benefit of highly reduced risk due to time diversification and you will most likely beat all professionally managed funds. You will have to spend minimal time managing your money and can go on and have a life free of worry. If you are a twenty-five year old starting a career say and want to contribute regularly to an IRA, where should you invest your money? REIT’s, Palladium futures, gold coins, Google or Netflix? No, invest it in the boring index, the Dow. By the time you are 60 and eligible to withdraw you will have a fortune, accumulating tax deferred and compounding at an 11.3% annual rate through all the ups and downs of the economy!